The “glory seekers” of 1861, as David C. Reavis calls his ancestors and others who answered the call to the colors, soon learned that war was anything but glorious. 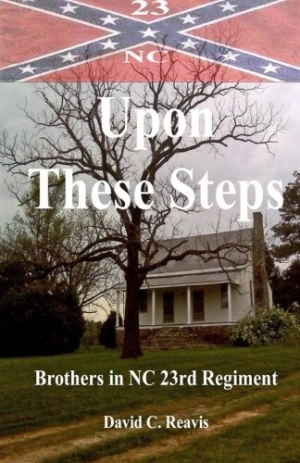 In Upon These Steps, Reavis chronicles the experiences of two brothers and their brother-in-law who served in the 23rd North Carolina Regiment, detailing how they suffered not just in battle but also in hospitals and prisoner of war camps. The author grew up in the house where these soldiers were raised, walked the fields where they farmed, and visited the battlegrounds where they fought. His thirty-five years of research into family documents, local records, and military histories and reports yielded a treasure trove of detail, but these are merely the buttons and braid to the well-tailored uniform that is Upon These Steps. This book is more history than historical fiction, and it is as much a story of a family as it is of three young men who went to war. Although the opening chapters about home life and that last Christmas of peace are crafted and presented like short stories, there is very little dialogue in the book, and it is written more as a narrative report than as a novel. While Reavis does focus on his own ancestors and their relatives, the experiences and emotions are universal to any family whose relatives have gone off to fight. Reavis, however, does not lose sight of the Confederate aspect of this tale, and scenes such as when one of his principals is patted on the shoulder by Stonewall Jackson less than an hour before the legendary general is mistakenly shot by his own men is the stuff of which Southern family legends are born. More curious is how Reavis handles the issue of slavery. On the one hand, the scion of the family reads a letter to his sons about the “moral and political evils of slavery,” but then he sends them off to fight for a cause that was meant to preserve that institution. That same family patriarch owns seventeen slaves, yet when the Emancipation Proclamation is signed in January 1863, he reads it aloud to his slaves and then sets them free at a time when both of his sons and his son-in-law are fighting for the Confederacy. If the book does have any failing, it is that Reavis gives away who lives and who dies even before the first bullet is fired. This removes much of the tension and suspense from the book, which, despite being a novelized chronicle, is still a work of fiction. As such, it could benefit from building up some apprehension among its readers about what may or may not come to pass. The battle scenes, except those at Antietam where one brother drags his wounded sibling from one part of that bloody field to another, are too brief, and in his brevity Reavis has discarded many dramatic opportunities to help readers connect more closely with his protagonists. Upon These Steps is a solid piece of both Civil War and family history. Its few shortcomings aside, it deserves a place on the nightstand of any who are intrigued by works of either genre.